New Client Offer: Half head highlights Surrounding colour Gloss toner Hydrating treatment Style cut Blow dry & finish Only $139! Le Salon Melbourne has been modeled on our Le Salon Chamonix in the French Alps in France. With our close connection to them we can offer you the latest fashions and ideas from Europe first-hand. Nv hair stands for envious we are the masters of all our services to short, to long curly to straight.we believe a good haircut is within a consultation. AMOS | HAIR owners Nik & Amelia, both have extensive education Nationally and Internationally.They have a award winning team who pride themselves in excellent service and will always try to exceed your expectations. Their passion for Hairdressing and Fashion keeps them motivated and inspired to keep you looking and feeling great! At AMOS | HAIR they believe the key to success is education, keeping them inspired and in contact with the latest trends. Only quality products are used including Kevin Murphy, American Crew, Revlon Professional and Eleven. All contain natural ingredients which aren't harmful to their clients or the environment. Recently awarded a Gold accreditation by the Australian Hairdressing Council for service excellence. 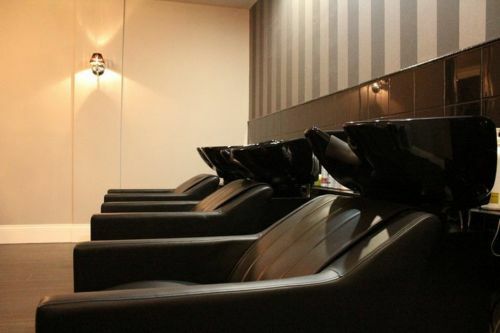 At each service you will experience their Shiatsu Massages Chairs whilst receiving a Head massage. Complimentary Beverages to order off their menu, including Alcoholic Beverages. Free wi-fi and Ipad use in their relaxed salon environment. Experience AMOS !